Tesla is a bit like Apple cool progressive disruptive and people just seem to be drawn to it, if you’re asked to think about an electric car the chances are you’ll think about Tesla, even if you don’t know much or anything about cars, you will know the Tesla brand. The global registration opened more than three years ago for the Model 3 with more than 325,000 people signing up and putting down a deposit. Currently, Tesla sells two cars in the UK at the Model S and the Model X and soon it will be joined by the Model 3. Now the Tesla has given first chance UK customers have had to look around the car and learn a bit more about it. At European launch, the Tesla Model 3 will be available in two guises- a long-range dual motor all-wheel drive model and the performance model, The long-range model can do 0 to 62 mph in 4.8 seconds with a top speed of 145 mph, Tesla owners get access to this supercharger network which is reserved for Tesla owners only but it’s no longer free to use but you can use other charge points as well. Using a supercharger you can get your Model 3 from 0-80% charge in around 30 minutes. the longer each model can do up to 338 miles on the (WLTP) cycle with their performance model during up to 329 miles. the performance model can do the 0 to 62 miles run in 3.7 seconds with a top speed of 155 mph. There is no key requires to get in the car, you just use your phone connected to low energy Bluetooth or there are two key cards if you want someone else to park it for you. There is some really cool stuff that you can access through touchscreen display, you can change the fan direction at just by moving it around or you can even split the Airstream so it goes over the shoulders of the people in the front and onto those in the back. There’s also this lovely or glass roof which gives such a feeling of openness to those in the front and the back and it’s also UV protected laminated and tempered. faced in the cabin has been maximized there are loads of little storage areas about the place and between the front and rear boots at the front and the trunk together have 425 litres of space. The front has bag hooks and you can take out the carpet in there if you want to put things in like muddy boots or sportswear. 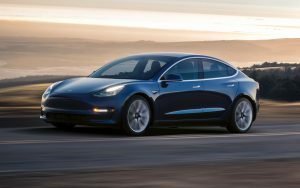 The model 3 comes with the same hardware as that found in the Model S and the Model X so that means eight cameras forward radar and 12 ultrasonic sensors so that enables all kinds of safety tech including collision avoidance and automatic emergency braking. Inside it is very simple and minimalist there are no buttons, you control everything through the steering wheel or through the huge 15-inch touchscreen and that includes things like speed and remaining charge and everything because there’s no driver display either. connectivity comes in two bundles- standard and premium. you still get a lot of kit in the standard one but if you need things that require quite a bit more data then you will have to pay a little bit more.